A Companion to Tudor Britain provides an authoritative overview of historical debates about this period, focusing on the whole British Isles. 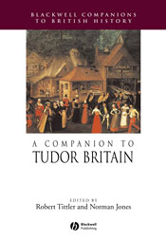 An authoritative overview of scholarly debates about Tudor Britain. Focuses on the whole British Isles, exploring what was common and what was distinct to its four constituent elements. Emphasizes big cultural, social, intellectual, religious and economic themes. Describes differing political and personal experiences of the time. Discusses unusual subjects, such as the sense of the past amongst British constituent identities, the relationship of cultural forms to social and political issues, and the role of scientific inquiry.